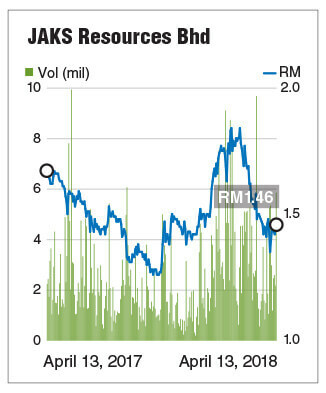 KUALA LUMPUR: JAKS Resources Bhd has decided that it will take a step back from the property market to focus more on infrastructure and power-generation projects, especially from renewable resources. But first, it has to finish construction of the RM1.1 billion Pacific Star development in Section 13, Petaling Jaya, by the end of the year. It also wants to sell off its 51% stake in Evolve Concept Mall in Ara Damansara, Petaling Jaya. JAKS has been seeking a buyer for its stake in the loss-making mall since 2016, which has been weighing down the group’s earnings. However, the oversupply of retail space in the Klang Valley has made that task difficult. Chief executive officer and major shareholder Andy Ang Lam Poah is hopeful of securing a sale soon as two investors who are keen on taking over Evolve Concept Mall have been identified. “We are still in the negotiation stage. One of the potential buyers is foreign and the other a local,” he told The Edge Financial Daily in an interview. Lam Poah is of the view that the retail landscape remains challenging, given a stagnant population in the Klang Valley and increasing mall space. “That’s why we think it’s not that ideal for us to keep the investment. We will try to dispose of it soon,” he added. In the next two years, JAKS sees the US$1.87 billion 2x600mw coal-fired thermal power plant in Hai Duong Province, Vietnam, driving the group’s profit growth. “Construction of the power plant is currently 22% complete and is targeted to reach 50% by the end of the year. There is a strong indication that work on the project will be expedited for full completion in 2020. As such, 2018 and 2019 are crucial years for us,” Lam Poah said. JAKS chief financial officer Steven Ang Si Eeng said profits generated from the Vietnam engineering, procurement and construction (EPC) project would be more than enough to cover the losses in Evolve Concept Mall from the high operating expenses, depreciation charge and financing expenses in financial year ending Dec 31, 2018 (FY18). The independent power producer project is a joint venture (JV) with China Power Engineering Consulting Group Co Ltd, marking JAKS’ maiden foray into power generation. Higher works recognition from the Vietnam EPC contract and a gain on disposal of land led to a surge of 159 times in JAKS’ net profit to a record RM126.68 million in FY17 compared with the previous year. Revenue rose 7% year-on-year (y-o-y) to RM676.87 million. According to JAKS, the RM55.1 million net profit contribution from the Vietnam EPC contract marked a 53% increase from RM36 million achieved in FY16 and its profit was the largest contributor to JAKS’ overall profit in FY17, excluding the disposal gain. Lam Poah expects the group’s earnings and revenue growth to accelerate in the next two years. In a report dated March 15, PublicInvest Research analyst Tan Siang Hing estimated JAKS’ net profit to normalise to RM79.5 million in FY18 and revenue to jump by 72% y-o-y to RM1.16 billion as construction of the Vietnam EPC project ramps up. “In FY18, we expect about 70% of the group’s construction revenue to come from our operations in Vietnam and the rest from our local projects,” said Si Eeng. Future earnings look rosy as the group has a 25-year power purchase agreement (PPA) for the power plant in Vietnam in its bag. “On completion of construction in 2020, the group will then enjoy recurrent concession-type earnings from the generation and sale of power under the PPA with Vietnam Electricity,” said Lam Poah. JAKS’ outstanding order book in the construction segment now stands at RM900 million, which will keep it busy for the next one-and-a-half years. “We are also pursuing infrastructure and renewable energy (RE) project opportunities worth RM2 billion, both in Malaysia and Vietnam. Our tender success rate is about 30% to 50% based on our previous records,” said Lam Poah. “In Vietnam, we are looking for opportunities to develop RE projects such as wind, biomass and solar. Vietnam has seen a boom in RE projects in a bid to meet the nation’s future demands for power,” he added. Lam Poah cited a Vietnam Investment Review report in January where Vietnam Electricity had estimated that around US$123.8 billion would be needed to develop the national power system within the next 20 years. Of this, 66.6% would be spent on power plants. “The report also stated that Vietnam plans to invest in up to 98 power plants with a total capacity of 59,444mw,” he added. Asked whether JAKS is considering going it alone as foreign owners or forming a JV, Lam Poah said a lot will depend on the size of the investment. “If JAKS is able to handle the project alone, then we will do it. If we are getting another 1,200MW project, then maybe it is too big for us and we will look for JV partners,” he added. In Malaysia, JAKS is eyeing to participate in public infrastructure projects involving road works, bridges, hospitals and sewerage treatment plants. “We are focused in terms of going into areas where we are strong and the chances of us winning the projects are high. We look at smaller, pocket projects such as water pipe replacement or sewerage plant instead of going after mega projects where we can’t compete with the big boys,” said Si Eeng. Like other contractors, JAKS is also eyeing a slice of Myanmar’s massive power and infrastructure markets. “We are currently studying the market there. If there are concession-type projects, we will consider pursuing them. But we are not bidding for anything there at the moment,” said Lam Poah. Last month, JAKS raised about RM60 million via a private placement, which some analysts viewed as too soon and dilutive to earnings. The group placed out 10% of its shares in March last year, also raising about RM60 million at the time. Si Eeng said the latest exercise is, however, necessary to address the near-term cash needs of the group’s property projects. More than half of the proceeds from the private placement went to finance construction costs of the Pacific Star project and the rest for working capital for Evolve Concept Mall and the placement expenses. “Our net gearing has improved. A year ago, it was about 1.1 times. It fell to 0.4 times in December last year and we expect to lower our gearing further this year. Our focus going forward is to drive our profits up,” he added. According to Bursa Malaysia filings, well-known investor Koon Yew Yin is the single largest shareholder of JAKS with a 21.11% stake as at April 10. Koon’s wife Tan Kit Pheng also owns 8.68% shares in JAKS. Lam Poah’s shareholding in the group stood at 9.9% as at Nov 1, 2017. JAKS shares closed unchanged at RM1.46 last Friday, with a market capitalisation of RM797.08 million. The stock has fallen 21% from its peak of RM1.84 on Feb 19 since the dispute with Star Media Group Bhd erupted. Star Media shares closed down three sen or 2.7% at RM1.08 last Friday.